Good reading skills are essential for every child to succeed in life and current research has shown a pattern in youth with court involvement being reluctant and/or struggling readers. Youth Opportunity Center, in collaboration with Ball State University, is developing a Reading Program to address this issue. The results of this study, with voluntary participants, has the potential to influence programs across the nation and YOC could immediately begin to offer the intervention if the residents clearly benefit. Since the early 90s, the Youth Opportunity Center, Inc (YOC) has provided a safe place for troubled children and families. Now, nearly three decades later, the YOC staff members who daily dedicate themselves to making a difference in a child’s life have helped myriads of young individuals. Believing that YOC culture is one of their most important assets and regardless of position or place all staff embrace their roles in the spirit of YOC’s core values: “a heart for kids, a winning smile, broad shoulders, helping hands, and a strong backbone.” This philosophy created a staff committed to providing the best possible treatment service to kids and families and, enabling kids to receive the necessary tools to be successful in life. YOC staff and leadership are intentional with developing good character with our residents. Character education is an integral part of the daily treatment milieu within the treatment programs and is modeled and emphasized with residents through all daily activities. YOC staff utilize all aspects of the child’s daily schedule to model, teach and develop character traits. As a nationally accredited, not-for-profit, juvenile behavioral treatment center YOC offers a complementary range of services on its 75-acre campus. 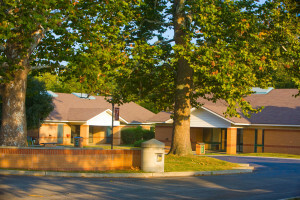 Residential treatment and outpatient counseling programs, on-grounds accredited school, day treatment program, psychiatric residential treatment facility, and a juvenile detention center all provide services that are holistic and address the emotional, behavioral, vocational, spiritual, and intellectual well-being of youth. The YOC’s intensive services are centered on evidenced-based treatment practices, which help build self-confident, strong, productive youth. The majority of youth placed into residential treatment exhibit externalizing behavior disorders, as the nature of their oppositional, violent, and/or criminally deviant behavior and is the primary concern that warrants an out-of-home placement. Cognitive Behavioral Therapy (CBT) has been well-established as an Empirically Supported Treatment for a wide variety of mental health diagnoses. Subsequently, CBT is the most broadly-used and well-supported psycho therapeutic treatment available and widely-used with children and families at the YOC. Research has found that CBT can be appropriately applied to a number of child and adolescent diagnoses, including mood disorders, anxiety disorders, Conduct Disorder and Oppositional Defiant Disorder. CBT is is used with a variety of group curriculums and treatments interventions. 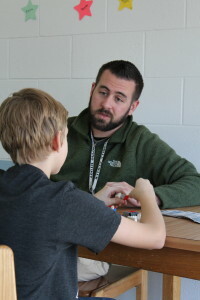 The Youth Opportunity Center works with a wide range of youth who are placed into residential programs, therefore the clinicians must be aware of how available evidenced based models apply to children and adolescents of different developmental stages, diagnoses, cognitive ability and personality types. Trauma-Focused Cognitive Behavioral Therapy (TF-CBT) (Cohen, Mannarion & Deblinger, 2003) has emerged as the treatment of choice for youth with trauma, traumatic grief and multiple complex traumas. Apart from Cognitive Behavioral Therapy, TF-CBT is the primary treatment modality used on the YOC campus. YOC has partnered with Ball State University (BSU) faculty, Dr. Janay Sander (Educational Psychology) and Dr. Ruth Jefferson (Special Education) to conduct a research study, funded by the National Institute of Justice, examining the effects of a reading program with residents who voluntarily participate in the project. Noting that there was a pattern in youth with court involvement being reluctant and/or struggling readers and knowing that reading is connected to outcomes later in life, including school achievement and being employable, this research will evaluate if the program is helpful to the youth. The results of this study have the potential to influence programs across the nation if the findings are significant, and YOC could immediately begin to offer the intervention if the residents clearly benefit. Known for it’s doctoral internship program YOC is also accredited by the American Psychological Association (APA), having over 79 participants from over 25 universities, with 15 students remaining in a post-doctoral role within the organization. Doctoral interns also assist in YOC’s Diagnostic Testing Program by administering objective and subjective testing instruments to youth and adults to help identify factors potentially impacting their daily living skills. YOC has a long history of providing quality psychological assessment and evaluations to assist Family Case Managers with the Department of Child Services, Probation Officers, and Juvenile Court in making prevention and treatment decisions for youth and their families based on professional evaluations.